“Anipals” is a new section on this blog, where I introduce you to cute and lovable anipals (animal friends) of mine. I have many, many anipals on Twitter. They’re all very cute, and their lives and “tails” of adventure are fun to read about. 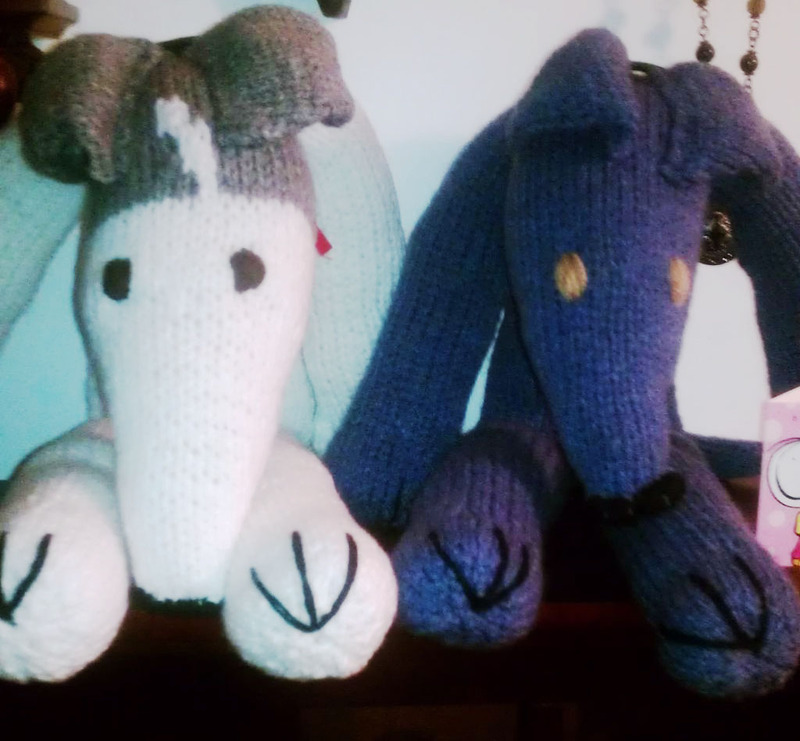 Today, I want you to meet brofurs, Vincent Rocket (left) and Gino Bagadonuts (right). They are both 3-year-old Italian Greyhounds from Dunedin, Florida. Vincent was rescued from a backyard breeder. Gino has been in and out of foster care most of his life. He was rescued last month from an Italian Greyhound rescue, and now he’s found his forever home. 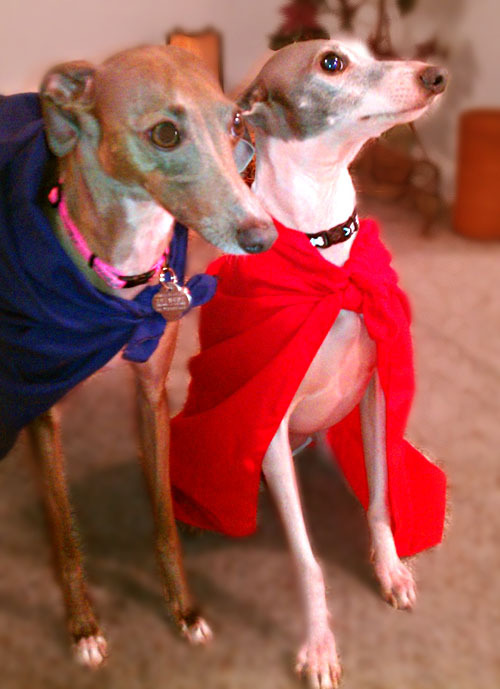 Both of these Italian Greyhounds love going on walks with their mom and dad, playing with their toys, and dressing up as superheros. They also like zoomies (running around very fast) and apples. Vincent loves Chabani Greek Yogurt. Vincent is a super good brother to Gino. Sadly, Gino has PRA (Progressive Retinal Atrophy) – an inherited eye disease in which the cells in the dog’s retina start to die. Dogs are born with normal eyesight, but after a few years, they develop night blindness. PRA causes progressive blindness, so eventually the dog will go completely blind. Vincent, who does not have PRA, helps his brother Gino when it’s dark by wearing a little bell. What makes these two adorable pooches even more lovable and fun to follow on Twitter is that they had Grandma Bobbins MiniMe’s made in their likeness. Both Vincent and Gino are quite active on Twitter. Follow them to learn more about their lives! 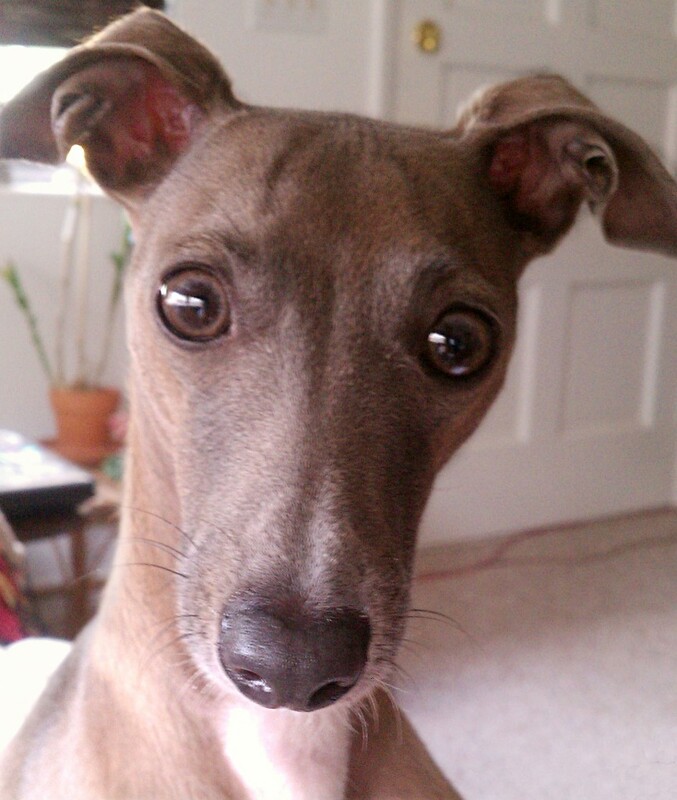 Italian Greyhounds are considered easy to train. They’re generally submissive and only want to please their owners. As a breed, they are friendly, affectionate, kind-mannered, and intelligent dogs. They’re an active dog breed that love to run around and play. Because of their short, smooth coat, these miniature greyhounds are very easy to groom. Although they may look fragile, they are sturdier than they look. As a whole, they are generally healthy dogs. They can experience health problems, including severe periodontal (gum) disease, drug sensitivities, broken bones in young dogs (under age 4), and certain inherited diseases. Love this. Be sure to keep sharing the awesome photos and writing. Seems like everyone has a mini-me these days. I know! I am jealous! I can totally empathize with the night blindness. I have lost my night vision and can’t drive at night and is very tough for me to see at nighttime without bright light. I love greyhounds, they are so elegant and beautiful, especially these two! Would Gino’s owners be willing to send in a DNA sample for pra research? If so could you have them contact me?